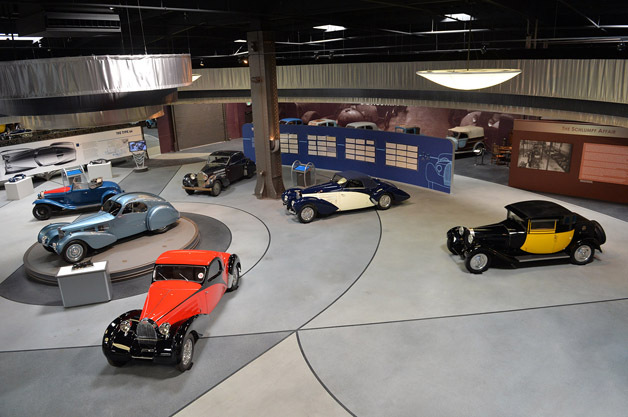 The Art of Bugatti exhibit at the Mullin Automotive Museum will debut as the largest assembled collection of Bugatti artifacts and automobiles while paying tribute to the Bugatti family’s enduring genius, creativity, undeniable contribution and significant work. The new display is scheduled to open Spring 2014 at the museum in Oxnard, California. All of the Bugatti family members exerted influence in their times and in various fields, representing the pinnacle of excellence and the best of an era. The Museum will house more than 50 pieces of furniture and paintings by Patriarch Carlo Bugatti and granddaughter Lydia Bugatti, numerous sculptures by his son, Rembrandt, and the largest private collection of Bugatti automobiles in the world created by son Ettore and grandson Jean Bugatti. The Art of Bugatti brings together dozens of Bugatti models including early 20th century carriages; an early Brescia race car; the race-winning Types 35, 37 and 51; Jean Bugatti’s Fiacre and Atlantic Coupe; the Type 57 C Aravis and Atalante; and the incomparable Type 41 Bugatti Royale. The collection will also display select unrestored automobiles from the Schlumpf Reserve Collection and the new generation of Bugatti automobile prototypes culminating with the Bugatti Veyron. The retrospective will include an extensive overview of the Bugatti family’s influence on the automobile as art. Many of the pieces will be exhibited and explored through drawings and factory artifacts, many unseen by the public prior to this exhibition. Following the intended run of The Art of Bugatti exhibition, the materials will form part of a traveling show available for presentation at museums and venues throughout the world. Details about the exhibit will follow in the coming months.